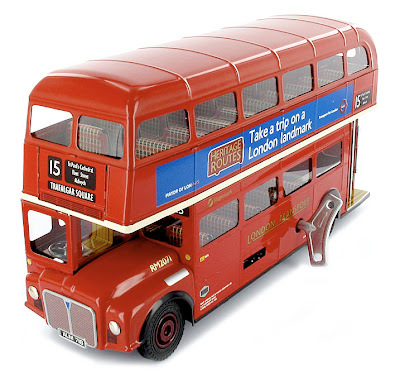 It seems that buses big and small are popular items with many collectors and model makers - certainly Mat Irvine’s news of the upcoming Revell scale kit of a London bus has struck quite a chord with visitors here at SMN. 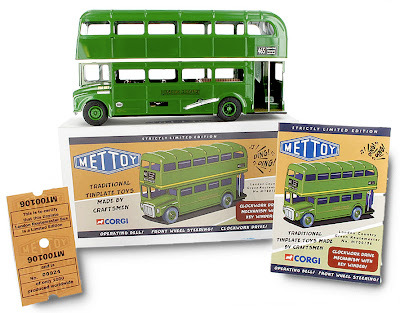 So it’s interesting to see the UK store chain ModelZone promoting on sale Corgi’s tinplate-style replica - boxed in retro-style as an old Mettoy product - of the classic Routemaster, made to 1:36 scale. It’s a convenient sort of size, a shade under 5 inches (122 mm) high, which allows it to sit comfortably on a shelf without taking up too much room. It’s also a scale to which many ‘tourist tat’ items are made too, including diecast London taxis, so you could create an entertaining miniature city scene quite easily. It’s also worth pointing out that while this Mettoy bus aims to replicate a tinplate ‘toy’ rather than a precision ‘model’, it does have some neat working features - front steering wheels, a ‘ding-ding’ bell, and a clockwork motor, with a big key that sticks out, ready for winding up that spring-powered engine. Then you can set those front wheels to one side, release the bus, and it will cruise round in majestic circles at your command. Great fun! The Mettoy Routemaster comes in two colours, the classic bright red of a London Bus, or the softer tones of a Greenline rural-run machine. The London route marked at front, rear and sides is number 15, which travels between St Paul’s Cathedral and Trafalgar Square... oh nostalgia! How many times did I catch buses on that route during my Fleet Street days? Erm dunno - ‘a lot’ covers it! I’m rather glad that the real buses offered seats that were somewhat softer than the curving tinplate ones provided here, even if they are neatly printed in the tartanoid pattern that only bus designers seem to come up with. The driver’s compartment is also somewhat familiar - I drove a Routemaster on an ‘experience day’ once, and that nearly-flat angle for the steering wheel certainly rings a bell. These tinplate models are available from ModelZone at less than half-price, making either (or both) of them a must-have if you like buses. The detail is actually pretty good for a tinplate, even if it is not intended as a high-detail product. And a further bonus is that both red and green buses come in handsome retro packaging, complete with a Limited Edition number printed on a simulated bus ticket. Mat’s recent article on the forthcoming Revell bus kit makes good reading here. The bus is available at ModelZone - along with other sale bargains - here. Pix courtesy Corgi, ModelZone, SMN studio.